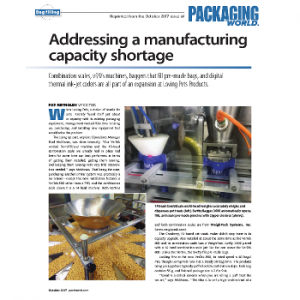 When Loving Pets, a maker of snacks for pets, recently found itself just about at capacity with its existing packaging equipment, management wasted little time in sizing up, purchasing, and installing new equipment that would solve the problem. The sizing up part, explains Operations Manager Brad McManus, was done internally. “Our VerTek vertical form/fill/seal machine and the 10-head combination scale we already had in place had been for some time our best performers in terms of getting them installed, getting them running, and keeping them running with very little intervention needed,” says McManus. That being the case, purchasing another similar system was practically a no-brainer—except the new installation features a VerTek 800 rather than a 750, and the combination scale above it is a 14-head machine. Both VerTeksand both combination scales are from WeighPack Systems, Inc. (www.weighpack.com).